Am early in the process of making my first real project – very early. 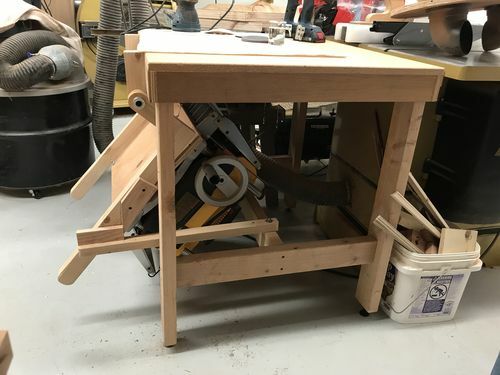 It’s a mobile fliptop unit for a mitre saw and planer. I’ve looked all around the Net and here at LJ and have most of “my” design worked out. From a relatively large number of design variations, I’ve measured my mitre saw and planer, settled on the dimension needed to place them between the “cabinet” walls and decided how long the wings are going to be – not as long as some, not as short as other. The one area I haven’t decided on is the “axle” around which the top rotates. There are variations ranging from using hardwood dowels centered in drilled out holes in the “cabinet” walls to using a 1/2” steel rod that fits into recessed steel bearings on both ends. The range of “choices”/variations in between these two extremes include carriage bolts, 3/8” aluminum conduit and even PVC in one design. I am not ashamed to say I am not an engineer (though my father was). I have little, actually no, I have NO background in structural mechanics. So, I’m kinda lost about how to choose what to use for the axle and how to connect it to the “cabinet” walls. All of the designs seem to work (else why would they be published?). I guess I could just pick one and go with it. I’d appreciate any thoughts or comments based on your experiences on the matter. BTW, my mitre saw is 56lbs and my planer is about 82lbs if that makes any difference in your response(s). Also, I’m making it out of pine or type-unknown pallet wood depending on how much pallet wood I have prepped the day I start actually cutting/screwing. When I built my fliptop stand a couple of floor flanges and a short piece of threaded galvanzied pipe did the trick. I would steer away from using hardwood dowels. Wood does not wear well as a bearing surface and has less load carrying ability than the alternatives. Steel rod or tubing riding in bronze bushings is a good option. For my planer flip up, I ended up using aluminum tubing in bronze bushings (the tubing was on sale cheap), but the aluminum will gaul over time and I will need to replace it. Steel is the best choice. WoodES: That’s one of the “heavier” (and costlier) designs I’ve come across. No criticism… just observation. TungOil: yes, wear down the line is a consideration. So, as you chose aluminum, how long do you expect it to last before wear becomes an issue – with function, not with looks? Well, without running all the bearing calcs I can’t predict how long it will last, but practically speaking is will outlast me. 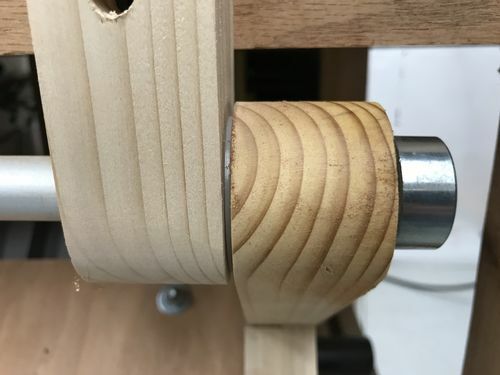 I use my planer at most a few times a week, I have a ~ 120 lb load distributed across two 3/4” diameter x 1” long bronze bearings that go through 3/4 of a turn rotation each time. The load in miniscule. I’m not too concerned. But, theoretically, steel is the better choice. This is my arrangement. Mine is not the typical flip top to switch between two tools. I keep my planer flipped out of the way on the end of my TS outfield table and flip it up when I need it. Looks like this when stored. Flips up clockwise and sits on top of the outfield table on my tablesaw. Nice. I like that and will have to consider it. If it were me I would use steel pipe and oak bearing blocks, because I have some. But like you say, I’ve seen people use lots of things from wood dowels, bolts, metal rod, iron pipe, metal conduit. Really the load is not much and won’t get much wear. Thanks for the observation. The flip top I made was used to address the challenges of a small space and the need to hold a spindle sander and small belt/disk sander. The stand is a standalone unit on casters to allow the tool to be moved as necessary (almost all of my tools are on casters, great for moving the tool out for use and cleaning) The stand is still being used today and I will change it to two separate or at least have both tools mounted on the same stand for easy access. I don’t recall what I paid for the pipe and flanges but given two tools were considerably more expensive than the hardware the cost didn’t seem to be a significant factor. The flip top supports the primarily used small belt/disc sand and the smaller jet spindle sander is hung under that until used. Because the stand is a separate unit there is no way to tie the sides together without the flange/pipe arrangement. The tools are mounted to a “almost” a torsion box (for lack of a picture or other visual aid). The torsion box allows the tools to be flipped through the center of the U shape formed by the sides. While a poor solution for accessories, it did solve the space problem. I’ll just add… if I were doing it again, I wouldn’t put the miter saw and planer on it. Just doesn’t tend to be convenient. I use both tools when I’m breaking down and rough-milling raw stock. I would put my belt/disk sander opposite the planer if I were doing it again since it’s used at the end of the project. 1/2” polished steel rod and bronze bearings. My flip top cart houses a Ridgid planer and belt/spindle sander. It’s an open frame design made with laminated 2×4’s instead of the standard plywood. As mentioned above, the rod and bearings don’t really take much load. They are only in play when the top is rotated. Other than that the load is static in the four lock points. For me 1/4” eye bolts and knobs. IMHO I wouldn’t overthink it too much. The number of times you’ll be rotating it you really won’t have to worry about wear. That’s probably why some use wood and it works fine. 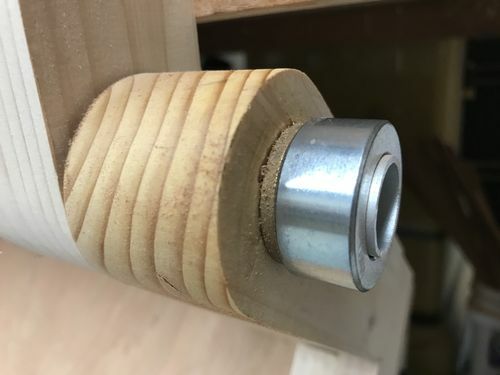 What I’d probably do myself would be use a 3/4” dowel fastened to the rotating table and use a couple slices off of a 3/4” pvc pipe in the sides as bushings. ID of the pvc should be close enough but if it’s a little tight you could sand the dowel down. I like to keep things simple and cheap!